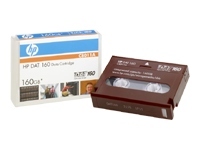 With 160 GB capacity and 12 MB/sec transfer rate, HP DAT 160 Data Cartridges offer the highest storage capacity and backup performance of DAT technology, extending the roadmap of the most successful tape backup product in history. New 'wide' format enables longer tape and greater capacity whilst still permitting backwards compatibility to DDS-4. DDS-4 and DAT 72 customers will still be able to read data written on older tapes, thereby protecting investment in older formats. New 'wide' cleaning cartridge specifically designed for the DAT 160 tape drive. HP DAT 160 media is exhaustively qualified for use with HP and non-HP DAT products. A continuous testing program in HP's media laboratory guarantees maximum restore performance. HP has 20 custom-built test chambers in use around the clock. 70,000 tests and 1.3 million test hours a year emulate real-world environmental conditions and usage. The goal of all this testing is to ensure that every tape works reliably the first and every time it is loaded into a drive.